With Windows 8, Microsoft has introduced the new Metro Style Apps and the App Store to distribute such Apps. End users can get Metro Apps on Windows 8 only through the App Store. The apps in the App Store are verified and certified by Microsoft. The restriction that you can receive Metro Apps will become a big inconvenience for developers since they can no longer write some Apps and give it their friends. They can't even develop some custom apps for their own use. Microsoft has a solution to this problem. Developers can get a developer license for their computer as well as other computers where they want to develop and test their Apps. The developer license is per computer and so if a developer want to test an App in multiple computers, he need to obtain separate licenses for each computer. How to get Developer License to test and debug Windows 8 Metro Apps? You will need to apply for a separate developer license for each computer you want to deploy your own Apps. 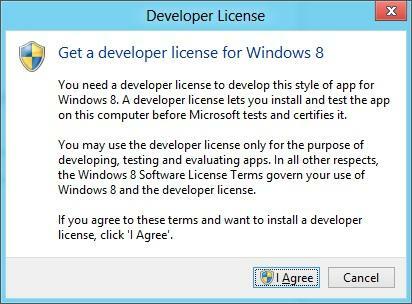 There are couple of ways to obtain Developer License for Windows 8. When you launch Visual Studio 2012 and create a new project for Metro App, Visual Studio will prompt you to apply for a Windows 8 Developer License. Simply process the wizard to get the Developer License for your computer. 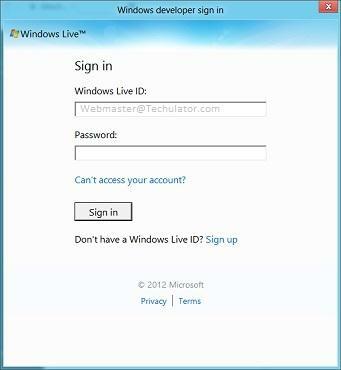 In the next step, you will be prompted to Sign In to your Microsoft account to get Windows Developer Account. The license you receive will be associated with your Microsoft Account, however, it will be specific to the current computer. Once you Sign In, you will receive a confirmation that a developer license is assigned to the computer and you will need to renew it once it expires. Typically, the license expires 30 days from the date of receiving it. 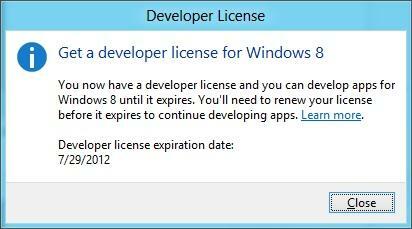 Do everyone need a developer license to test Windows 8 Metro Apps? If you want to test a Metro App on a computer without downloading from App Store, you will need a developer license. Windows will not allow you to run an App unless it is verified and verified by the App Store. The only exception is, apps for testing the computer with a developer license.